Like any good explorer, I am working hard at and enjoying learning about the local food here in America Samoa. Here on this island there are a wide variety of fruit bearing trees. The most common of these are Esi or papaya, Coconut and Fai or Banana. Additionally Starfruit, passion fruit, limes and lemons are quite plentiful. One of the most intestesting of these is the Sou’a. This banana stand apart in many ways. When I first saw these at the market, it was their red-orange skins that stood out to me. I had to know more! In American Samoa, not everybody knows about this special fai. Many people whom I show this too are taken aback. 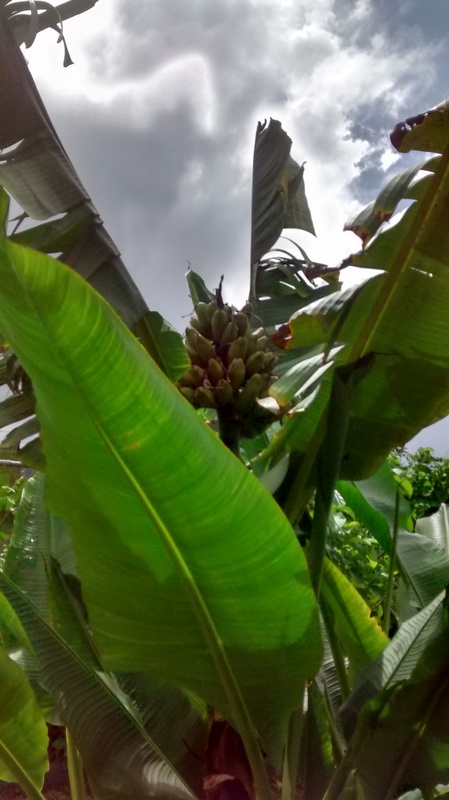 There are two common bananas here on the island of Tutuila. The first is fai palagi or white banana. These are green bananas that you boil or cook in an umu (rock oven covered with leaves). The second is the yellow banana. Most people are likely to be familiar as these are the types most commonly found in grocery stores and are eastern right out of the skin. In the category of yellow two special types, Masuluki and Samoa are much sweeter varieties. However nothing (in my opinion) beats the Sou’a! First thing, the sou’a grow straight up from the banana tree, where most varieties dangle. When you harvest these, generally you have to cut the whole tree down. Not to worry, this signals the plant and it quickly grows again to produce another stalk of fruit! These fai are considered a super food. The levels of nutritional quality were hard for me to link in this post but consumers more that the quantity from just a few dried chips will cause the color of their urea to change, showing a neon yellow of excess nutrients being discharged. There are several ways to prepare this wonderful plantain. Many love it just as any other banana. It’s a wonderful year warmed in a hot car, left in the sun or microwaved and covered in honey and some lime juice. It can be sauteed and prepared with a wide variety of meals, andprepared like sweet potatoes with marshmallows. For the wise traveler, dried chips are a great nutritional snack by themselves or with your favorite ingredients for a trail mix. Don’t let the color throw you off, if you ever have a chance, Sou’a are a great treat!